The station building, now extended, survives as a private residence. The goods lock-up has been converted into a garage. Notes: The name 'Swaffham' is derived from Swabian; the people of the German state of Swabia (now defunct and divided between Bavaria and Baden-Württemberg), some of whom are believed to have come to Britain with the Anglo-Saxons. The town of Swaffham in Norfolk derived its name from the same source, as did the Cambridgeshire village of Swaffham Bulbeck. 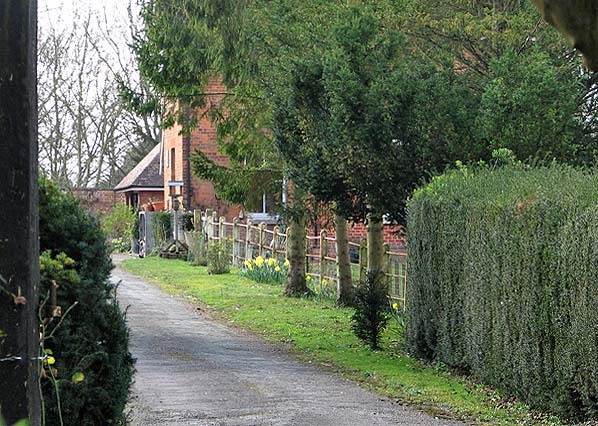 The latter village is on the present-day B1102 road between Lode and Swaffham Prior and is worth a mention as it has something which puzzles railway enthusiasts and historians not familiar with the area - Station Road. Station Road leaves Swaffham Bulbeck in a north-westerly direction then turns south-west to become Long Meadow Road, and then Swaffham Road. It forms part of the B1102 and eventually becomes Quy Road at the southern end of Lode village - the opposite end of Lode to Bottisham & Lode station. Thus Station Road, Swaffham Bulbeck, led to no railway station at all. The road was named Station Road in the early twentieth century and the reason for this in not known. However, the road's former name, Gutter Lane, may yield a clue. The two Cambridgeshire Swaffhams, Prior and Bulbeck, were reportedly referred to as Great and Little Swaffham respectively in Domesday Book but the present name of Swaffham Prior is said to have come about through its inhabitance by monks who originated from Ely. This, of course, was before the Church of England was formed by Henry VIII in the sixteenth century. Swaffham Prior's two churches are well worth a visit as is Foster's windmill which is open to the public at certain times and is one of the very few remaining working windmills. Foster was the family famous for the mill opposite Cambridge station and the bank in Cambridge city centre. As outlined in the Mildenhall Branch History, Swaffham Prior was the birthplace of the Mildenhall branch as a result of the persistence of Charles Allix and the desire of the GER to have a diversionary route to avoid flood problems along the Cambridge - Ely - Brandon route. As things transpired, the Mildenhall branch was to serve as a diversionary route only for the Cambridge - Ely line as it was never built beyond Mildenhall. The address of the Allix family was 86 High Street, Swaffham Prior; an address better known as Swaffham Prior House - a large country house set in extensive and much-wooded grounds. The Allix family continued to inhabit Swaffham Prior House until the 1980s. Quy excepted, station buildings on the Mildenhall branch all bore a family resemblance. The single-storey range contained a booking hall, stationmaster's office, waiting room, toilets and staff room. 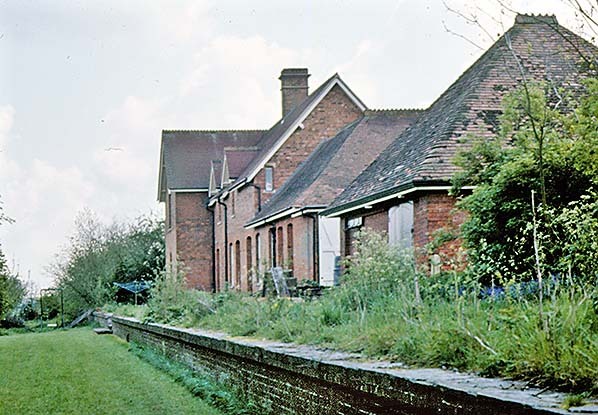 The L-plan brick building included a two-storey stationmaster’s house with the single-storey range attached. On the two-storey section, facing the forecourt, the principal gable was under a half-hipped roof, and a slightly recessed section adjoining the office range was treated to its own pitched gable with timber braces. The door of the office range which gave access to the booking hall was sheltered by a gabled porch supported on brackets, and beyond it was a large unadorned gable. There was one doorway to the platform from the booking hall and waiting room with a second doorway serving as the Way Out from the platform. Gents' toilets were entered from the platform while access to the ladies’ toilets would be from the waiting room. Separate brick lock-ups were provided, apart from at Quy where a smaller lock-up was provided within the building. Fireplaces were provided in each room with semi-ornate stepped chimneystacks on the roof. Although this broad description applied to all branch stations apart from Quy, the finer details varied from station to station as did orientation according to whether stations were on the up or down side. The exception to this description was Swaffham Prior. Whilst it followed the general description it differed in detail in a number of ways, partly owing to the presence and involvement of the Allix family. 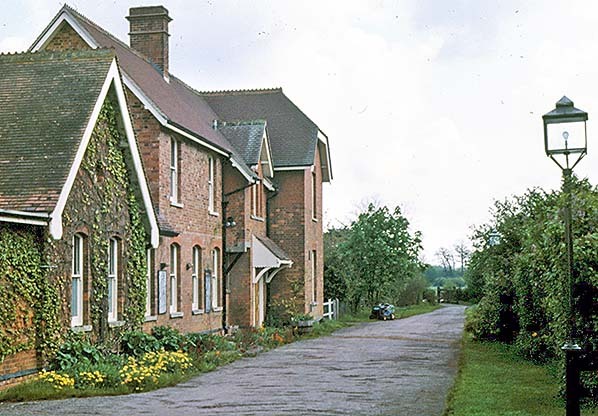 The station buildings at Swaffham Prior were similar to those at Isleham but as the former was on the up side and the latter on the down side, the buildings at Swaffham Prior were of reverse layout. 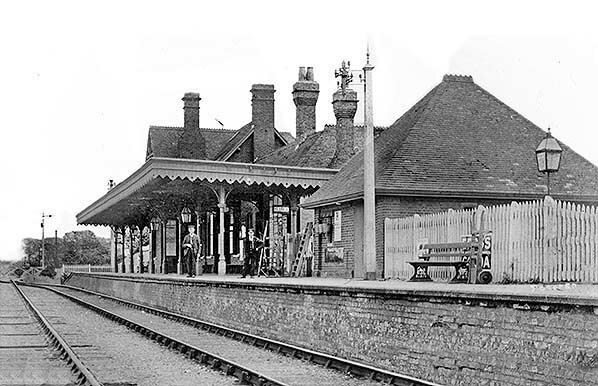 A further difference was that Swaffham Prior's buildings were a reverse layout to the other up side station buildings, namely Bottisham and Barnwell; at Swaffham Prior the stationmaster's house was at the Mildenhall end whereas at Bottisham and Barnwell it was at the Cambridge end. 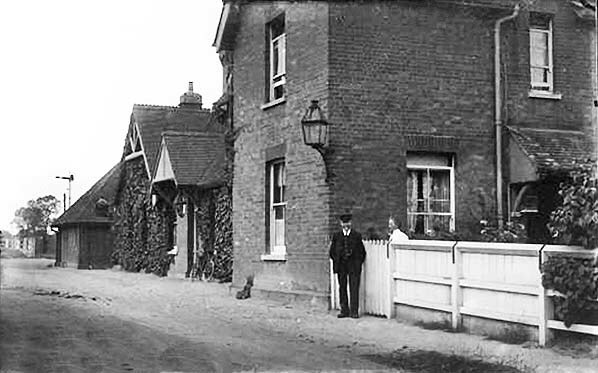 The reason for this, at all branch stations, seems to have been the location of the station approach road, so the first building one encountered on the approach road, staff cottages excepted, was the stationmaster's house. Evidence of the Allix family, or of GER attempts to please them, at Swaffham Prior was the tiled roofs with ornate crested ridge tiles. This detail was also included on the lock-up which had a steeper roof pitch, compared to sister buildings at other stations, to match the roof of the main station buildings. The gents' toilets, at the usual location at the opposite end of the building to the stationmaster's house, were of a more substantial design and were apparently fully enclosed (as opposed to having the once common semi-open type of urinal). The brick lock-up was further away from the main buildings than at Bottisham. These two features were found at all branch stations apart from Quy and, as mentioned, Bottisham. It is possible that, in the early years at least, there was a private waiting room for the Allix family. However, no conclusive evidence of this has been discovered and the station building seems to have contained the same standard facilities as at other stations along the line. 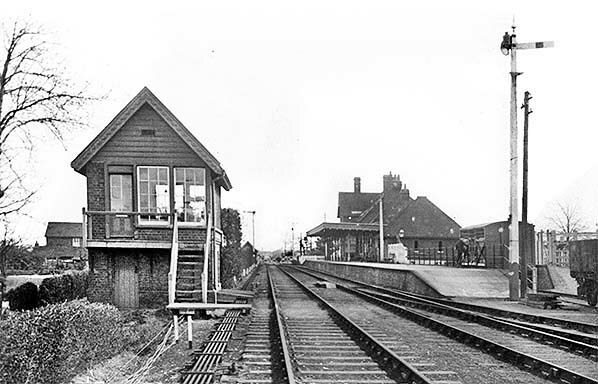 The signal box was unique to the Mildenhall branch in that it had a steeper pitched roof. This was a nod to the Allix family, and the roof pitch matched those on the other station buildings. A rather odd-looking structure, the 22-lever signal box was one of those abolished in 1935 but it remained standing until the line was dismantled. 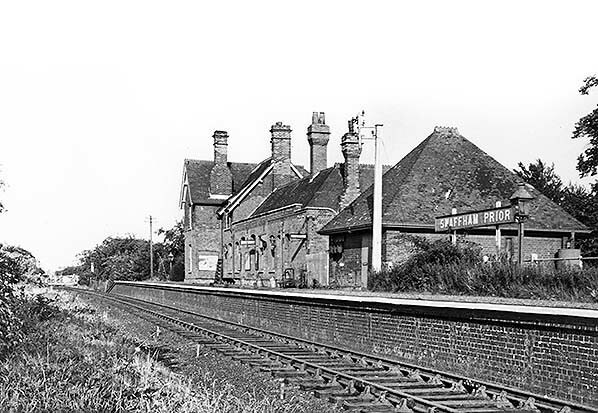 Swaffham Prior was another branch station at which the stationmaster's position was abolished in 1921, thereafter coming under the jurisdiction of Barnwell Junction. The platform canopy was removed around the same time. Swaffham Prior station was located some half a mile to the north-west of the village and alongside the northern boundary of the grounds of Swaffham Prior House. A tree-lined private avenue connected the house with the station. The avenue still exists today. There was a level crossing, No. 27, at the Mildenhall end of the station on Station Road and close to which once stood the Allix Arms public house; this was east of the level crossing and on the up side. It ceased trading in 1975 and is now a private residence. Set back from Station Road, it now looks nothing like a public house. West of the level crossing and on the down side of the railway some staff cottages were provided - three it is believed. 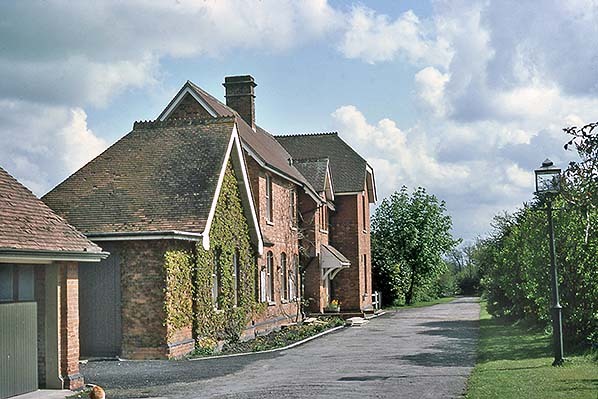 These were given the same crested ridge tiles as the station and are still inhabited today. One might reasonably assume the crested ridge tiles were also applied to the signal box and crossing keeper’s hut but this does not appear to have been the case in respect of the signal box at least. The station itself had a single platform, 360ft long, and an 850ft goods loop. As at Quy, this loop was removed in 1935 and left the same peculiar kink in the running line as it turned in to serve the platform. Signals were also removed at the same time due to the abolition of the signal box. Also as at Quy, Swaffham Prior signal box was switched in only when the yard needed to be shunted and / or when there was a need to use the goods loop. The latter appears to have been rare, so the lifting of the loop and abolition of the signal box made good sense. Goods facilities were at the Cambridge end of the station and on the up side. This was another feature peculiar to Swaffham Prior. Provided were a 100ft refuge road; a 200ft dock road; a 180ft coal road and a 50ft headshunt. The coal road was south of, and parallel to, the dock road where two cattle pens were provided. There was also a weighbridge, on the south side of the yard and close to the coal road, plus a loading gauge. Access to the goods yard was via facing and trailing points from the platform road. When the goods loop through the station was in situ there was a further set of points from the loop and facing in the down direction. After 1935 a ground frame was installed, unlocked by Annett's key with train staff and ticket. 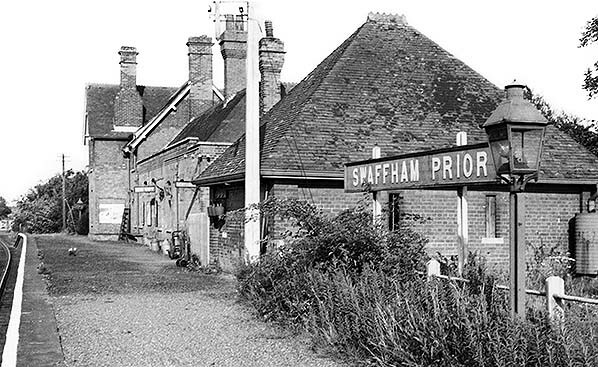 One little oddity concerning Swaffham Prior station and which existed throughout its life was the rendering of its name. The signal box nameboard and the station signage presented the name correctly, i.e. Swaffham Prior, but paperwork, such as timetables (and the route map, based on timetable practice, drawn to accompany this article) tended to present the name incorrectly as Swaffhamprior. Tickets were even worse; of those which have been seen the GER and LNER printed the name as one word and in block capitals. BR did a little better, with some tickets showing the one word block capital version but others showing the name as two words albeit again in block capitals. The use of block capitals, on any tickets, usually applied to the destination station, with the originating station being in lower case after the initial capital letter. However, even this was inconsistent with some tickets showing both originating and destination stations in block capitals. As a point of interest, soon after leaving Swaffham Prior in the down direction the line entered a 120ft wide cutting. It was at this point where the line cut through the Devil's Dyke, one of several ancient defensive earthworks in the region (see the Newmarket and Newmarket & Chesterford pages). Nearby, the remains of a Roman villa were discovered complete with its near intact hypocaust (a form of underfloor heating used by the Romans). The trackbed and cutting are, at the time of writing, intact at this point but the site of the villa has long since been covered over again. This is a modified detail from the same 1902 map. For clarity the platform canopy has been removed. The red area is the stationmaster's house, the green area the station building; the brown area, the gents' toilet; the blue area the lock-up. The larger spacing between the station building and the lock-up, compared to Bottisham, is evident. The L-shaped structure between the brown and blue areas is something of a mystery, but from what few photographs are available it appears to not to have been a structure as such but fencing with a small gateway. 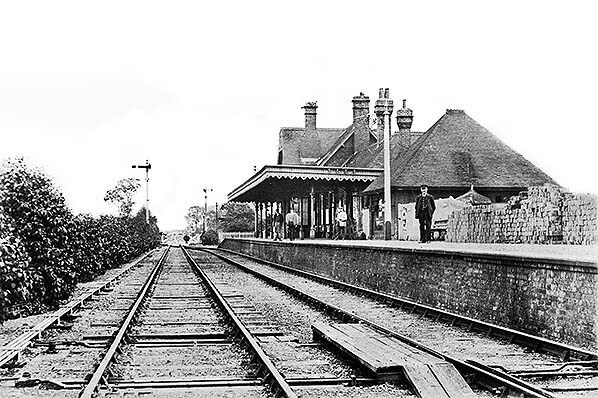 Swaffham Prior station before March 1905, looking towards Burwell. The steeper pitch of the signal box roof to match the station roof is apparent, as is the slightly odd appearance this gave the box. In the distance, on the down side, another small pitched roof building can be seen and this also appears to have complied with the 'matching set' requirement. The building is believed to have been the level crossing keeper's hut. Apparently the level crossing continued to be manned until total closure of the line as a record survives in the National Archive from 1964 concerning the withdrawal of attendance. This seems rather strange given that after closure to passengers only one goods train per weekday traversed the line, but this practice was not uncommon and even Quy station continued to be manned until the very end. On the right we have a reasonable view of the dock road with a cattle pen partly in view and a solitary cattle wagon. These wagons once proliferated across the entire British railway network but today just a small few survive in preservation. To the left of the signal box one of the staff cottages can be seen. A pre-1916 view of Swaffham Prior station with stationmaster Robert Arnold on the platform, left, and leading porter Edward Arnold, right. This image provides a fair impression of the station roof detail with its crested ridge tiles. The wide gap between gents' toilets and lock-up (the nearest building) is not so apparent from this angle. Swaffham Prior station is seen in British Railways days, beginning to look a little unkempt. The short curve at the end of the platform as a result of track curvature can be seen. This feature was found only at the Burwell end of the station. Note the oil lamp; the platform, at least, at Swaffham Prior remained oil lit to the end. The lamp casement has the station name, in two words, on its glass. The last passenger train ran on 16 June 1962 and BR wasted no time in starting to remove fittings such as lamps - the very next day, Sunday 17 June, in fact. The process was, however, quite long-drawn-out and items such as running-in boards were dealt with at a later date. It seems that even in 1962 BR had some awareness of certain items having a value to collectors. A broad view of the station in British Railways days. An advantage, for historians and modellers, of platform canopy removal is that a better idea of station building details is provided. In this view, for example, we can see where the 'Way Out' from the platform was located. The entrance was the adjacent doorway. There is a sign on the door of the lock-up. It is unreadable but presumably says 'Private'. On the left, nature has long since reclaimed the site of the goods loop while in the distance there is no obvious sign of the crossing keeper's hut; perhaps nature has hidden it from view. 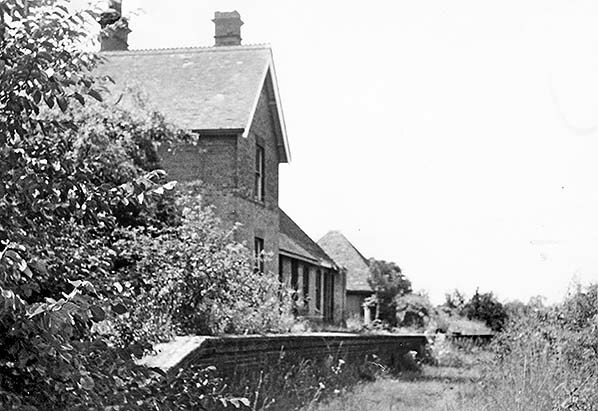 Swaffham Prior station in July 1969 looking towards Bottisham and Cambridge, some 4½ years after the track was lifted. The steeper pitch of the lock-up roof is more apparent from this angle as are the crested ridge tiles of the former stationmaster's house. The gap between lock-up and station building is also somewhat more apparent in this view. Nature is by now well and truly taking over the platform but, after all, following closure it would not have required a platform ticket! Swaffham Prior station in July 1969 looking towards Burwell and Mildenhall. The former stationmaster's house still appears to be in fair order but signs of dilapidation are evident with the rest of the station. 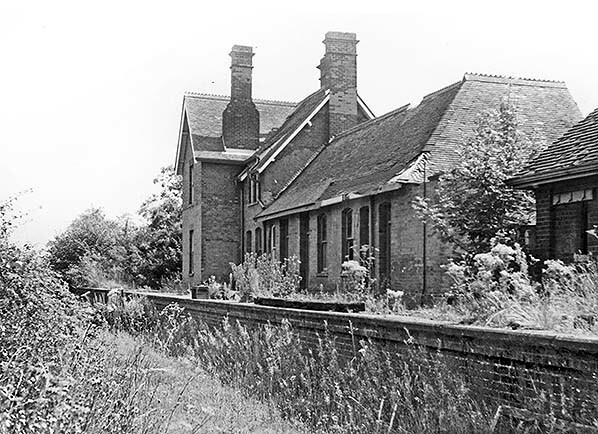 By the time this photograph was taken the next station down the line, Burwell, had already ceased to exist yet it was the last station on the branch to close. All good things come to him who waits - as the saying goes - but in this case it is applicable to Swaffham Prior station. On 14 May 1977 renovation work is underway. The former trackbed has been lawned and the first floor of the house has been extended over part of the station building. Note the sympathetic addition of matching gables. The roof of the new extension also has crested ridge tiles but this refinement is not readily apparent from this angle. Swaffham Prior station forecourt on 14 May 1977. It has to be said that a splendid job has been done of renovating the station and adding to its accommodation whilst retaining its original style, even though the original gable over the entrance has gone. The ivy climbing up the wall appears to have been a feature of the station for much of its life. It is not known if the two noticeboards fixed to the wall are of railway origin. If they are, they probably date from the BR period. The lamp on the right is not original and a further example can just been seen further along. However, the bushes on the right mark the point at which the private avenue from Swaffham Prior House arrived at the station, so it is quite likely that an oil lamp or two once stood where the electric lamps now provide illumination. With the exception of the ridge tiles, the roof is now of slate. A similar view from a little further back in 1981, The goods lock-up has been converted into a garage. The gap between the lock-up and the gents' toilet is apparent in this view. A peep at Swaffham Prior station from the approach road in March 2011. Visible are parts of the stationmaster's house and lock-up. Some of the familiar GER fencing can also be seen. Readers are reminded that the site is very much private property.